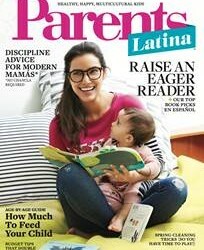 Meredith Co. has launched Parents Latina, a quarterly English-language magazine targeting “Hispanic Millennial Moms,” a group that apparently requires its own parenting tips –and one that doesn’t care less if the words Parents and Latina don’t really go well together in a sentence. Meredith Co. already has Ser Padres, a Spanish-language magazine targeting, ahem, Spanish-speaking parents, and Parents magazine, an English-language magazine targeting English-speaking, non-Hispanic parents. But apparently none of these was good enough for needy, self-serving Hispanic Millennial Moms, who just like all other millennials, just have-to-have-their-own-thing. Instagram your breast-feeding process and wow your friends! I don’t know, but once I get my hands on one of these I’ll keep you guys posted. This entry was posted in journalism, Marketing & Advertising, Print media, Stupid propositions and tagged Meredith, Parents Latina, Parents magazine, Ser Padres. Bookmark the permalink.